The last time we talked, the Village supposedly was acquiring a grant to clean up the hotel property, the effort to foreclose was put on hold, and a private citizen hoped to get the property himself and have the debris removed by John Paulding Days. In our next installment …. Two weeks ago, a village official said the only thing the Village had done was check with EPA to see what the town’s course of action would be if they are found to be responsible. So as of today, May 30, it has been 136 days since the fire destroyed a building that was a hazard and an eyesore four years ago. We seem to be no closer to having it cleaned up than it was the day after the fire. Why doesn’t the Village just go in and remove the debris and be done with it? Who would complain or protest – two “owners” who both deny ownership (and culpability)? So, when is somebody going to clean up that hotel? One of the biggest questions on residents’ minds these days is the lingering debris from the Hotel Barnes fire a.k.a. the “brick pile,” “the brick yard,” etc. It’s been well over 100 days since the blaze and the rubble appears to be no closer to being cleaned up then it was the week after the fire. But actually, the matter has been smoldering behind the scenes since January. Here’s a brief synopsis of what’s been going on. The hotel’s owner is a corporation that basically is out of business and has no assets. The statutory agent resides in Florida. The hotel was sold on land contract a couple of years ago, but that contract was not fulfilled. There’s more than $5,000 in back taxes owed. Under normal circumstances, if owners of a property don’t take care of cleaning up debris from a fire, tornado, etc., it could be cleaned up by a municipality and the owners assessed for the cost. That won’t work in this case since there’s already back taxes owed, the corporation has no assets, and apparently Florida law won’t allow costs to be attached to any property owned in that state. Therefore, local authorities here no recourse to force the owner to address the situation. Paulding Village has resisted getting involved, saying at various points that it’s not their responsibility, they won’t waste taxpayers’ money, they don’t have money to do cleanup (which they say is estimated at $30,000), they don’t have authority to trespass on the property. They’ve also said “we’re working on it” and that no one wants to see it cleaned up more than they do. There have been innumerable phone calls, emails and sidewalk conversations between various parties about this. Paulding Chamber inquired with a Village official about having a public meeting to discuss the situation and options, but never receied a response. A couple of weeks ago, a private citizen (one who is intimately connected with this blog) approached one of the commissioners about the back taxes owed on the hotel. He, in turn, talked to the county prosecutor, who immediately set in motion the procedure to foreclose on the property. Once the procedure started, it would take 120 to 150 days (which would be late September or late October) to complete. The paperwork was ready to file, but at the last minute, the Village asked the prosecutor to hold off because they were trying to acquire a grant to have the property cleaned up. The Paulding Chamber had made some contacts about finding grant money. While the grant/foreclosure scenario is in limbo, a new wrinkle has appeared: a private citizen told the chamber that he is trying to acquire the hotel property from the owner and hopes to have it cleaned up before John Paulding Days. Soon, thousands of people will be in town for Relay For Life (June 1-2) and then John Paulding Days (June 7-9) and the Paulding County Fair. A large number will drive by “the brick pile” and wonder why it’s still there. Hopefully, someone will be stepping forward soon and do what needs to be done for the good of the community. 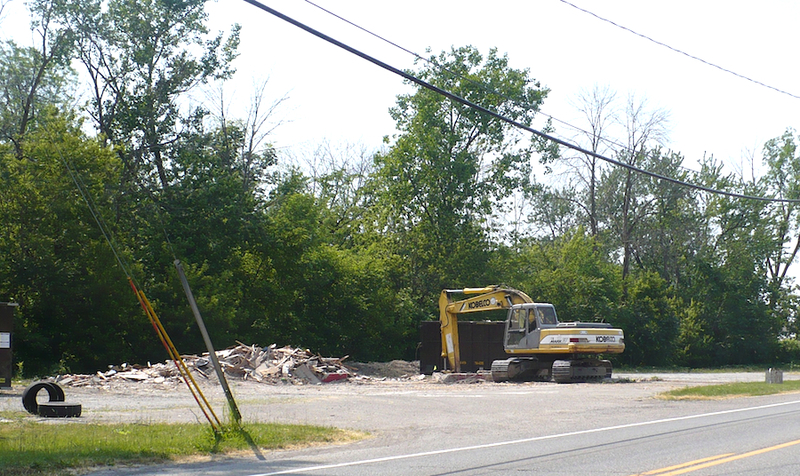 Stykemains have started demolishing the two vacant buildings along East Perry Street (U.S. 127) across from the sheriff’s office. One building is already gone. Having this site cleaned up will make the approach into town much more attractive to visitors. Great job! When you see someone from Stykemain, mention how much you appreciate this project. With the advent of Memorial Day many people will be visiting our town for Memorial Day activities and events. There is still time to help make a good impression of our town by making those last little cleanup and yard maintenance chores, mowing and removing weeds – beauty is in the details. WHEREAS, the Council of the Village of Paulding has determined that it would be in the public interest to establish regulations relating to the placement of signs within the Village of Paulding, Ohio and the same being done in the interest of safety. (b) All Ordinances are to be construed in favor of promoting vigorous political debate and accommodation of the rights of residents and visitors to speak freely. The provisions of this chapter shall be uniformly enforced without regard to the content of any advertising message or the identity of the proponent of that message. The provisions of this chapter supplement building standards established by the Ohio Building Code and Ordinances pertaining to zoning and the regulation of business enterprises. In the event of a conflict, the more restrictive standard shall apply. (a) As used in this chapter, the terms: “Sign”, “Closed Sign”, “Ground Sign”, “Marquee Sign”, “Open Sign”, “Portable Sign”, “Projecting Sign”, “Roof Sign”, “Temporary Sign” and “Wall Sign” shall be accorded the meaning attributed to them by the Ohio Building Code. (b) “Abandoned Sign” means a sign that no longer carries a readable message or that directs the public to a location where goods or services advertised are no longer available. (c) “Area” means the area encompassed by the smallest circle, ellipse, triangle, rectangle, trapezoid, pentagon, hexagon or octagon that completely contains a sign, including any perimeter frame, but excluding all supports or uprights on which the sign may be placed. Where a sign consists of individual letters, words or symbols, the area of each component shall be computed and total sign area shall be computed as the sum of the areas encompassed by the individual components. (d) “Billboard” means any sign advertising, identifying, or directing attention to any product, service, entertainment, or commercial activity that is not offered on the lot on which the sign is located. (e) “Building Frontage” means the length of any exterior wall of a building facing a public right of way. In a building that is subdivided by a party wall or walls into spaces with separate exterior entrances, “Building Frontage” means the length of the exterior wall or walls of the building facing the public right-of-way measured to the center of the party wall or walls. In the event a building or building unit fronts more than one public right-of-way, the “Building Frontage” shall be separately calculated for each facade. (f) A “Dilapidated Sign” and/or a “Neglected Sign” means a sign that does not present a neat and orderly appearance, which may be manifested by any of the following characteristics: rust or holes on or in the sign or sign structure; broken, missing, loose or bent parts; faded or flaking paint; non-operative or partially non-operative illuminating or mechanically devices; and missing letters in sign copy. (f) “Erect” means to construct, assemble, install, alter or relocate a sign and includes the acts of attaching, affixing, hanging, suspending, painting and placement of signs, but does not include repair or replacement of changeable copy, repainting, cleaning or other maintenance that does not involve the repair or replacement of foundation elements, structural members or electrical components. (i) “Illuminated Sign” means any sign that is illuminated by any internal or external light source other than non-reflected natural daylight or ambient public street lighting. (j) “Obscene Sign” means a sign that depicts or otherwise communicates matter deemed “obscene” or “harmful to juveniles” under standards established by the Ohio Revised Code. (k) “Person” means any individual, corporation, business trust, estate, trust, partnership, limited liability corporation or other legal entity. (l) “Political Sign” means a sign promoting a candidate for elective office, a political party or a ballot measure. (m) “Real Estate Sign” means a sign advertising the sale, rental, lease of the premises or part of the premises on which the sign is displayed. (n) “Vehicular Sign” means any sign attached or applied to or painted on a vehicle for the primary purpose of advertising or directing attention to a product, service, entertainment, or commercial activity but does not include words, graphics or other communication that serves to identify the vehicle as one ordinarily and routinely used and operated in the course of the business advertised. (o) “Window Sign” means a non-illuminated sign painted on, applied to or installed inside a window for viewing from outside the premises but does not include window displays of merchandise. (a) With the exceptions set forth hereinafter no signs, including but not limited to permanent yard signs, shall be erected on public property or within any public right-of-way except by governmental authorities in the discharge of a governmental function or pursuant to a license to occupy the right-of-way granted in accordance with Ohio Revised Code §131.03. Any sign so located shall be deemed a public nuisance and subject to immediate removal. (b) No signs shall be erected by nailing, fastening or affixing the sign in any manner to any tree, rock, post, curb, utility pole, natural feature, official street sign or marker, traffic control sign or device or other structure except as may be set forth herein. (c) The erection of memorial crosses, signs or statues to commemorate the place of a traffic accident or other death shall be prohibited. (d) No sign shall be placed or erected on either public or private property without the permission of the owner. (e) Commercial signs, including sign structures, shall be deemed abandoned if the business, service or commercial site to which it relates has been discontinued/closed for ninety (90) days. (f) Dilapidated and/or neglected and/or abandoned signs, including the structure and supports for said signs, shall not be permitted. (j) No illuminated sign shall be erected in any place that results in objectionable brightness or glare in any residential premises or on any public right of way. (k) Abandoned Signs, Obscene Signs, Portable Signs, Roof Signs and Vehicular Signs are hereby declared to be a public nuisance and are prohibited. (a) Political signs may only be displayed for sixty (60) days before the candidate or issues appears on the ballot and they must be removed no later than five (5) days after the election. Political signs may be placed in the right-of-way, however, they shall not interfere with road or highway visibility or obstruct or otherwise interfere with the safe and orderly movement of traffic or pose a hazard to pedestrians or traffic. Political signs shall not exceed thirty-two (32) square feet in area. (b) Garage, basement, porch or other casual sale signs may be erected in residential areas as long as they are not in violation of other sections of this ordinance. This type of sign may not be present for more than three (3) days after said sale. (c) Temporary banners or signs announcing educational, religious or public events shall be permitted on the premises where the event is to occur, however, they shall not be larger than twenty (20) feet square. (d) Street banners may only be placed on the right-of-way of non-limited access roadways and must vertically clear the pavement by at least eighteen (18) feet. Such banners must be placed a minimum of 1,000 feet apart. (e) Real estate signs may be placed in the right-of-way, however, they shall not interfere with road or highway visibility or obstruct or otherwise interfere with the safe and orderly movement of traffic or pose a hazard to pedestrians or traffic. SECTION VI-MAINTENANCE OF NON-CONFORMING SIGNS. A sign that was lawfully erected but fails to comply with one or more subsequently enacted regulations may be maintained and used but shall not be substantially improved, enlarged or otherwise altered. SECTION VII-UNAUTHORIZED SIGNS AND SIGNALS, HIDING FROM VIEW, ADVERTISING. (a) No person shall place, maintain or display upon or in view of any street any unauthorized sign, signal, marking or device which purports to be, is an imitation of or resembles a traffic control device or railroad sign or signal, or which attempts to direct the movement of traffic, or hides from view or interferes with the effectiveness of any traffic control device or any railroad sign or signal, and no person shall place or maintain, nor shall any public authority permit upon any street any traffic sign or signal bearing thereon any commercial advertising. This section does not prohibit either the erection upon private property adjacent to streets of signs giving useful directional information and of a type that cannot be mistaken for traffic control devices, or the erection upon private property of traffic control devices by the owner of real property in accordance with Ohio R.C. 4511.211 and 4511.432. Every such prohibited sign, signal, marking or device is a public nuisance, and the Police Chief is authorized to remove it or cause it to be removed. Whoever violates or fails to comply with any provision of this chapter is guilty of a minor misdemeanor and shall be fined not more than one hundred dollars ($100.00) for each offense. A separate offense shall be deemed committed each day during or on which a violation or noncompliance occurs or continues. This Ordinance shall be in force and effect from and after its earliest period allowed by law. “Never never, never quit”. Winston Churchill, British Prime Minister and statesman. I sat at a table with some good friends and enjoyed some good conversation and a delicious lunch. As I sat looking at the well maintained Courthouse and the surrounding lawn with the trees and landscaping, a sudden sense of pride came over me. As I looked at the view around the square from my vantage point, discounting the empty retail space and lack of building maintenance, and the brick pile, that sense of pride came over me again, the view I was seeing was coming from an envisioning, a mental vision of what once was and what now could be. The views of the architecture of the old buildings were impressive, you have to look closely at the architectural details to appreciate them and look beyond the needed maintenance of some of the buildings, imagine what they could be. I had conjured up this mental vision of what this downtown area could look look like with some serious community pride, effort and support to create an environment to sustain, attract and support local retail businesses. The vision I had conjured up was that of little specialty shops, maybe a sidewalk cafe – might as well have what I want since it was my vision – with nicely maintained buildings, some restored to the original period decor, with street and sidewalk improvements with plantings. Lots of people walking, talking, shopping, just enjoying their surroundings, you know that quality of life thing. You need to go, today not tomorrow, to the courthouse lawn and sit for a few minutes and look at what a great opportunity we have, see if you see what I envisioned. Allow your mind to formulate a vision of what this town could be. Seriously, if we build a nice community they will come. Let’s start today with a commitment to work together to create a vision and see that vision through to fruition. “Make no little plans. They have no magic to stir men’s blood and probably themselves will not be realized. Make big plans; aim high in hope and work, remembering that a noble, logical diagram once recorded will never die, but long after we are gone will be a living thing, asserting itself with ever-growing insistency. Remember that our sons and grandsons are going to do things that would stagger us. Let your watchword be order and your beacon beauty. Think big”. Your identity will not be published with any comments you wish to post.. Your identity will not be required wether you are logged in or not logged in. Just write your comments and enter “Publish”.